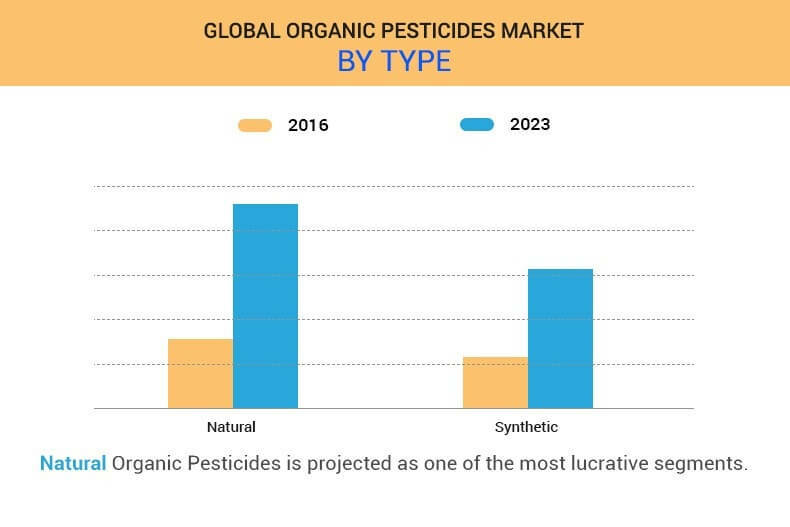 The Global Organic Pesticides Market size was $99,200 million in 2016 and is expected to reach $279,195 million by 2023, registering a CAGR of 14.9% during the forecast period. Organic pesticides are of two types-natural and synthetic. Natural pesticides are obtained from natural sources such as animals, bacteria, minerals, and plants. Synthetic pesticides, on the other hand, are man-made and composed of chemicals and other poisons. They are usually made from synthetic materials that either directly kill the pest or render it inactive. The global organic pesticides market is segmented based on type, crop type, mode of application, and region. Based on type, the market is bifurcated into natural and synthetic. Based on the crop type, the market is classified into permanent and arable. Based on mode of application, the market is classified into seed treatment, on farm, and after harvest. By region, it is analyzed across North America, Europe, Asia-Pacific, and LAMEA. North America held a significant market share of 32.0% in 2016 and is expected to reach 27.0% by the end of forecast period. Asia-Pacific is anticipated to dominate the market by the end of 2023. This is attributed to the rise in awareness about the uses and benefits of organic pesticides in this region. Based on type, the global organic pesticides market is bifurcated as natural organic pesticides and synthetic organic pesticides. The natural segment is anticipated to witness the highest growth during the forecast period. This is mainly attributed to the increase in awareness about the benefits of using organic products across the globe. Permanent pasture is the land used for five or more years for forage, including natural and cultivated crops. Arable land includes land under temporary crops such as cereals, temporary meadows for mowing or for pasture, land under market or kitchen gardens, and land temporarily fallow. The arable segment is expected to hold the largest market share in 2016 and is expected to witness the highest growth rate during the forecast period. The prominent players in the global organic pesticides market have strategically focused on product launches as their key strategy to gain significant share in the market. This report provides an extensive analysis of the current trends and emerging estimations in the global organic pesticides industry. Competitive intelligence of leading manufacturers and distributors of organic pesticides helps understand the competitive scenario across geographies. Comprehensive analysis of factors that drive and restrain the growth is provided in the report. Organic pesticides are the types of pesticides obtained from natural sources such as animals, bacteria, minerals, and plants. Rise in demand from end users, especially from the developing countries, and continuous technological advancements boost the growth of the global organic pesticides industry. Several advantages that boost the growth of global organic pesticides market during the forecast period are reduced environmental damage, necessity for smaller amounts for effective coverage, targeted action, and quicker decomposition. Furthermore, the popularity of organic pesticides has increased substantially in recent years, as extensive research has enhanced their effectiveness. A recent trend that has gained traction in the global organic pesticides market is the growth in public concern over the potential health hazards of synthetic pesticides. This in turn is expected to drive the growth of global market. However, lack of profit from niche market products is expected to hinder the market growth. The Asia-Pacific organic pesticides market is expected to grow at the highest rate, owing to increase in adoption, specifically in the emerging countries, such as China, India, Japan, and Korea. Moreover, the production cost of organic pesticides is moderately low in the Asia-Pacific as compared to other regions.